If you love the satisfying feeling of actually getting a project done, or want to have an arsenal of quick-to-make gift ideas on hand, then Crochet In A Day is for you! 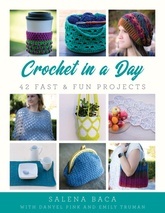 Featuring 42 pretty projects, there’s something for everyone here. From wearables like cowls, hats, slippers, and even a poncho, to home items like place mats, dish cloths, and baskets, every item will crochet up fast! This is a book you will turn to again and again when looking for a fun, speedy project that doesn't require a large time or yarn commitment. Perfect for using up stash yarn or to create something from that perfect skein you were saving, these patterns are creative, colorful, modern, and stylish. Get your hook ready, and crochet something today!